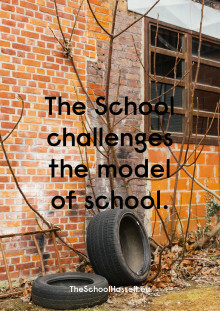 The School is an independent and international program on a quest for the happy city. The School researches how we can shape a different, better and happier city, along with its community. The difference is made in the practical and effectiveness of the multidisciplinary and collaborative idea. All creatives will have a different disciplinary background and will think, react and create as an individual and collaborator, part of a multidisciplinary and effective (compact) team. The School offers an active post-academic residential program of 6 months per year for two teams of 8 people, starting in October 2017. The School is a creative residency programme of 6 months where 2 teams of 8 young and international talents are provided with the right tools to take on a common challenge. The School researches how we can shape a different, better and happier city, along with its community. All creatives will think, react and create as an individual and collaborator, part of a multidisciplinary and effective (compact) team. No matter what discipline, we call these creatives designers, for their dedicated role towards chosen subjects. With its closeness, scale and focus on practicality, The School creates effectiveness in multidisciplinary collaboration. The School is located in Hasselt, a Belgian micro-city of 77.000 inhabitants, from 130 different nationalities who live together on 102 square kilometers. The School is located across the train station in a former hotel, also home to food heaven Tajine and a few temporary study and entrepreneur hubs. 3. Do I have my own space? The School is designed as a compact and multidisciplinary influential space to be creative at your best. There is a large common space (ideal for presentations and group meetings or workshops), 5 do-rooms (themed craft, sound, photo, print and textile, all have their material and tools to experiment or craft) and 2 basecamps and play rooms (home to each team and work or play related). Each team member has the ability to work together with the 8 members in the basecamp or be specific in the do-rooms of choice. 4. So, how does it work? The School offers an active programme of 6 months per year. During the 6 month cyclus each artist conducts one bigger research, presented at the showcase festival in April. Various smaller projects are a constant throughout the 6 months. All elements and circumstances at The School are to facilitate collaborative projects, however, whether the projects are collaborative or individual, is a free choice of every designer. The School is organised by a core and local superteam of 4 experts with complementary talents and experience. The resident designers have constant and active support from team coaches and do-room specialists (craft, sound, photo, print, textile). On a regular basis various international experts and artists will give workshops, talks and one on one feedback. Finally, there is the outer super circle of The School, a network of international specialists in education, creativity and business, who will provide constant feedback and exchange of knowledge. All resident designers will publish a number of artistic products. Regardless the material or depth, the standard size is A5 and will be sold in limited editions. All resident designers will create and conduct workshops with participants of the local community, authority, (art) schools, … on a monthly base, outside The School walls, to share their knowledge. There are monthly presentations, open-doors, visits, talks, workshops, exhibitions, … and at the end, there is the showcase festival. 5. Who can put him or herself as a candidate? The School select sits resident designers via scouting and an international call. The 2 teams of 8 designers need to have a specific balance and choice of disciplines and talent, to keep the inner creative disturbance of each team active. Age is irrelevant, neither the diploma (bachelor, master, whatever). Regardless of previous education or work experience, it’s possible to take a complete other role in the group. The call will ask for conceptual maturity and potential to grow. The language of all talks and workshops and communication at The School is English. The vibe however is free and multilingual and the smile is its universal communication tool. Designers can choose the language of their artistic expression. 6. What kind of support do I have? The School is a non-profit entity, traditionally speaking. The School is however also a profitable entity, meaning all designers and people involved are meant to grow and gain knowledge, and contribute to the goal of urban happiness. At this moment there is no funding to support you financially, although this is our aim and we hope to collect some grants to make this possible with the help of local, regional and international authorities. The School offers its residents 6 months of free education and 24/7 free access to think, play, collaborate and create in all spaces. 7. What will it cost me? Time, time, time and openness to share, collaborate, fail, start over, communicate and work together. We do expect monthly results (A5 publications) and presentations (workshops outside The School). It will be hard to combine this residency with another fulltime job. End of June 2017: Are you in? Final selections will be published on the website of The School. We all love Christmas: The School is closed from 23th of December until 7th of January 2018. 5th of May 2018: Farewell dinner: we say goodbye, but not for long! 9. Who decides if I’m in? At The School, it’s not about the big names, we focus on the content. So there is no fancy jury, the decision will be the result of the local superteam together with the team coaches. Please note that the formation of the 2 teams will be decided along the way, so it can be in your advantage to apply before the deadline. Sooner than later! Like any other designer, you retain full copyright on the work developed during the residency. When works are made in collaboration with others, it’s your responsibility to make clear agreements on beforehand about IP. Photographs of the works may only be used to promote The School. Any other use of the photographic material may only with permission of the designer. You can not claim any rights to reproductions of your work for promotional, non-commercial purposes. When The School wants to present the work you’ve made during your residence at another festival or exhibition within the next five years, The School won’t be charged an extra fee (except travel costs). 11. Who to contact when I still have some questions?